2. Add the ginger, urad dal and mustard seeds. 3. Fry till the mustard seeds splutter. 4. Add onions, green chillies and stir well. 5. Pour 500 ml water. For every cup of rava pour 2 cups of water. 7. Add godhuma rava and salt. 9. Add peanuts and cook till done. 10. Add the lemon juice and stir. 11. Garnish with curry leaves and coriander leaves. Image credit: chef in you. 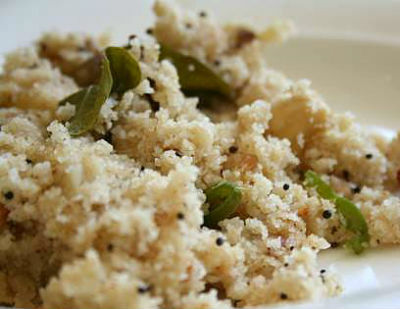 Feel free to comment or share your thoughts on this Godhuma Rava Upma (Cracked Wheat Upma) Recipe from Awesome Cuisine.